Discussion in 'Nebraska Engine' started by Lee, Apr 6, 2008. I thought I would start a new thread as this is new information. 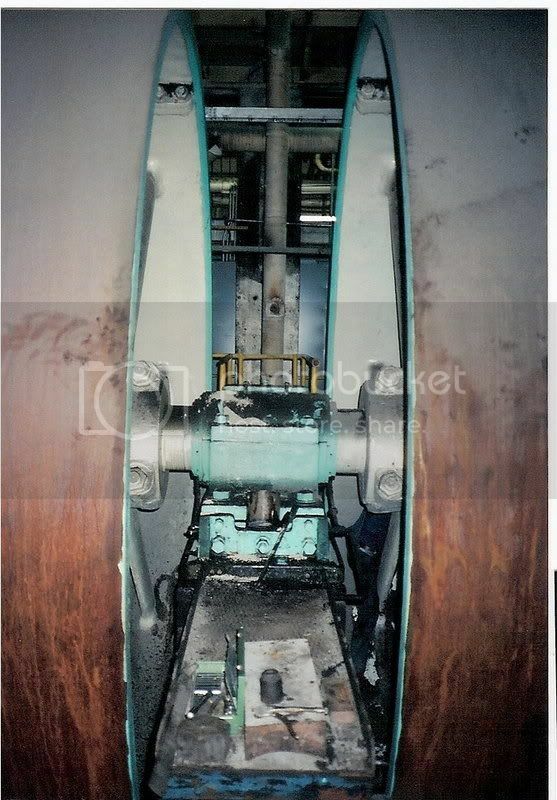 First I would like to thank Mike and Linda Johnson of Newfolden MN, who while on one of the trips to get the engine, took these photos of the disassembly. I would also like to thank Jeff Nielson who scanned those photos onto a disk. 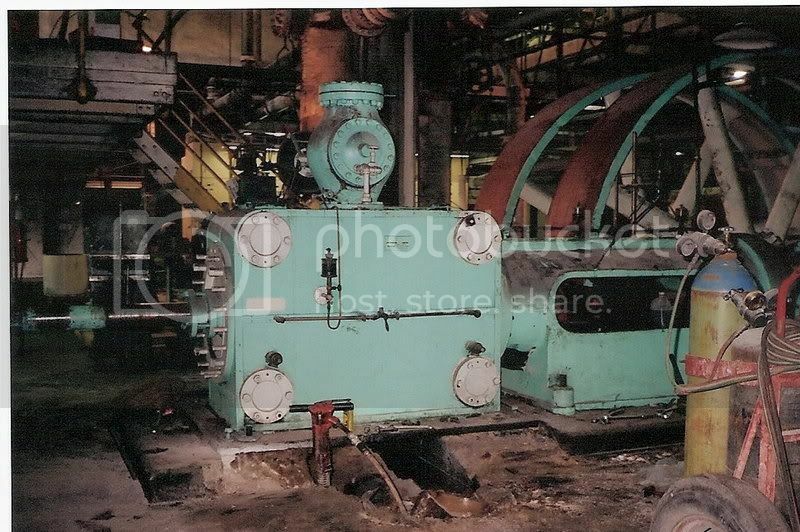 Here is the engine at the Western Sugar plant in Nebraska. Note the jackhammer busting up the base so they could get a jack underneath the cylinder. 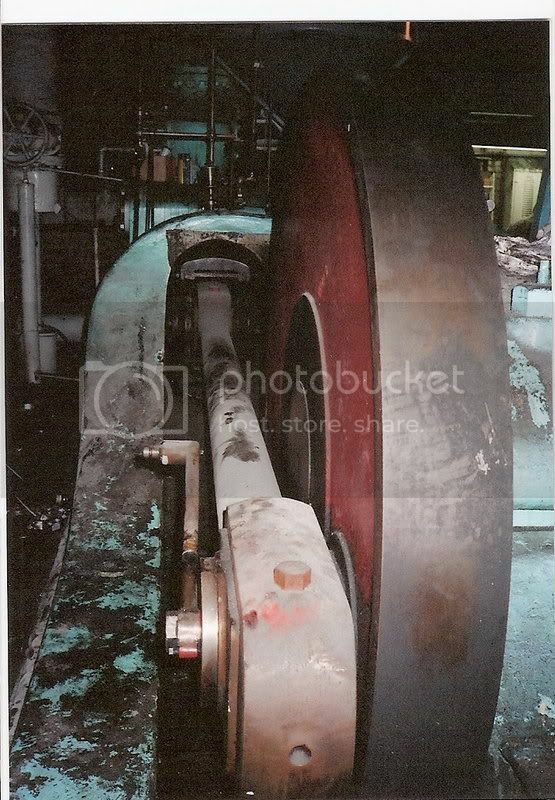 A view along the connecting rod and crank disk. Probably the most unique feature of the engine is the dual flywheels. 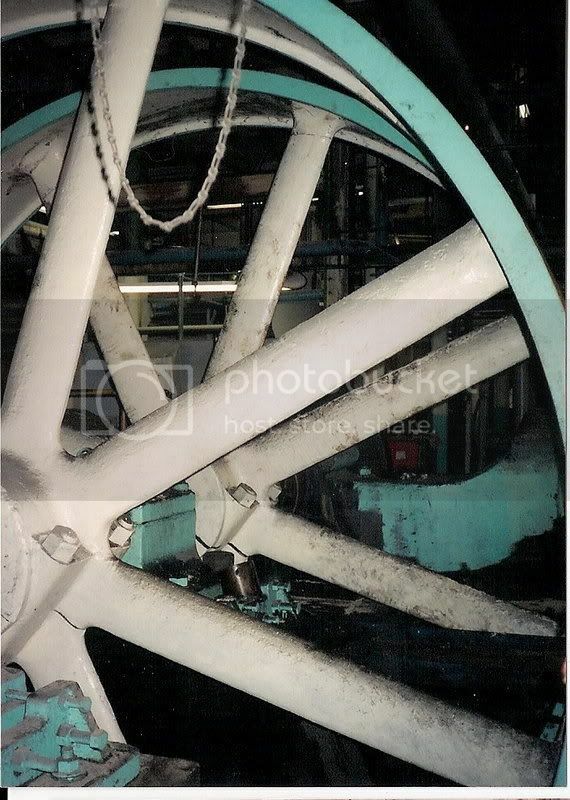 This will give you an idea of the size of the flywheels. Here is a shot of the center crankshaft bearing. 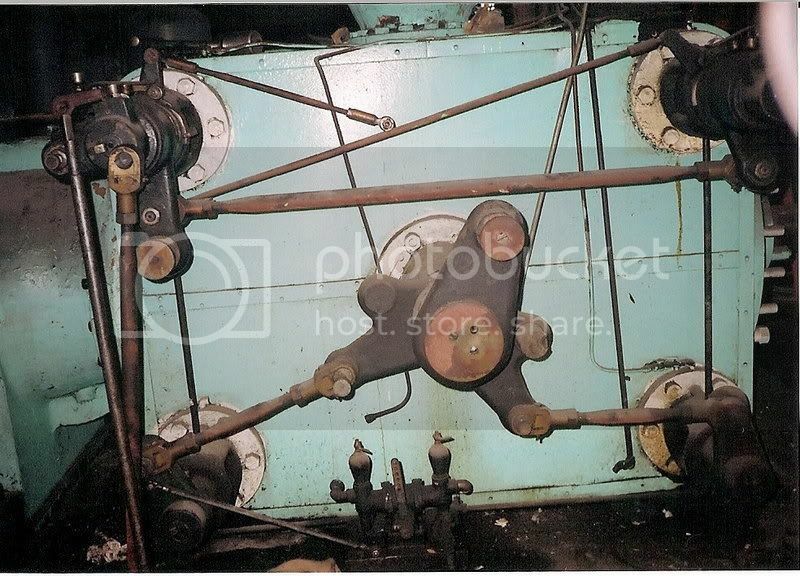 A photo of the Corliss valve gear. There was also a two cylinder steam powered air compressor that was brought back at the same time. 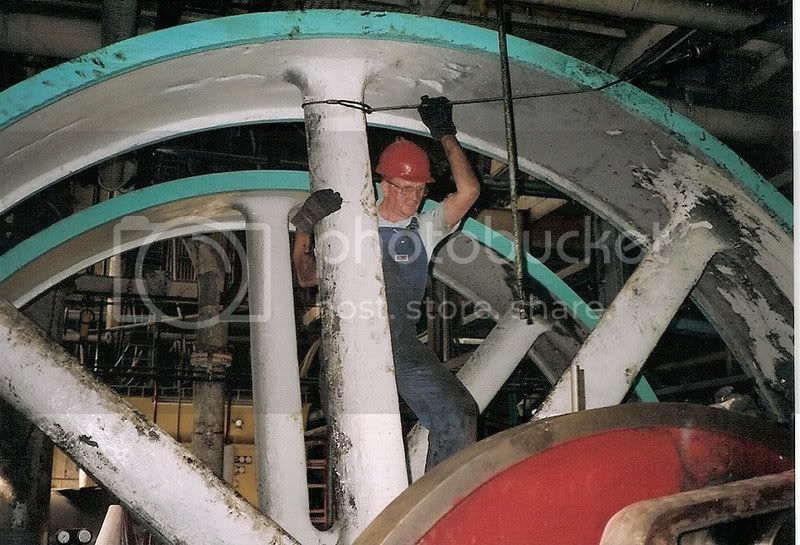 I hope everyone enjoys the photos and a final thanks to Mark K. for the thread on posting photos off of Photobucket. Here is a photo of the "other" Nebraska engine. 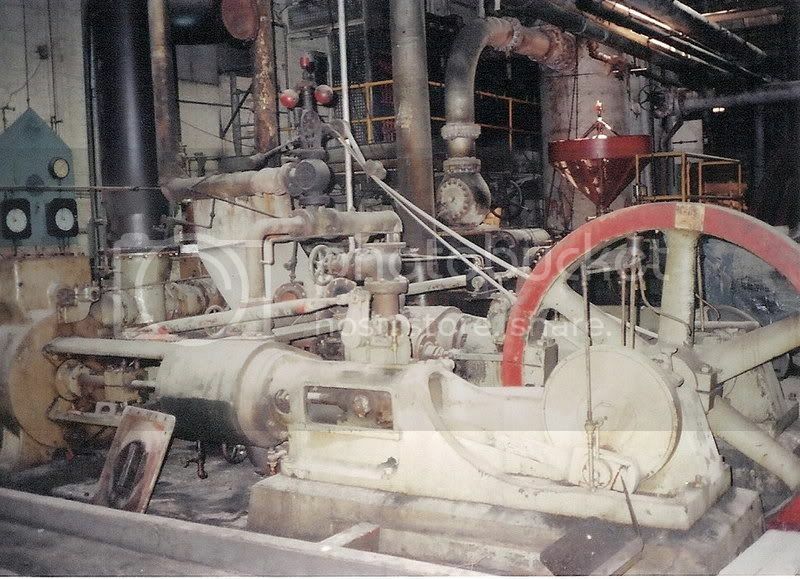 It is an two cylinder steam powered air compressor that was right beside the Corliss engine. Here is a photo taken by Wayne Johnson (Mike and Linda's son). From right to left:Royce Granlin, Dennis? Goodyke, Mike Johnson, Jim Todahl, Bennet Moen. The second year crew was made up of Elroy Amunson, Mark Hamre, Mike Johnson and Linda Johnson. Please correct me if I am wrong on any of this. I believe proper credit should go to all parties involved. Dennis? Goodyke, Bennet Moen. I apologize for any confusion. Great job on the thread Jeff! I am glad you were able to get all of the photos rounded up. They will sure be needed to get the engine back together! I had no idea that this engine was that big! I am sure happy that all of you folks are going to get everything collected and in one place again. Thank you to all involved! For those of you that don't know, the BOD of WMSTR decided last year (or maybe two years ago) to give the Nebraska engine to another show. 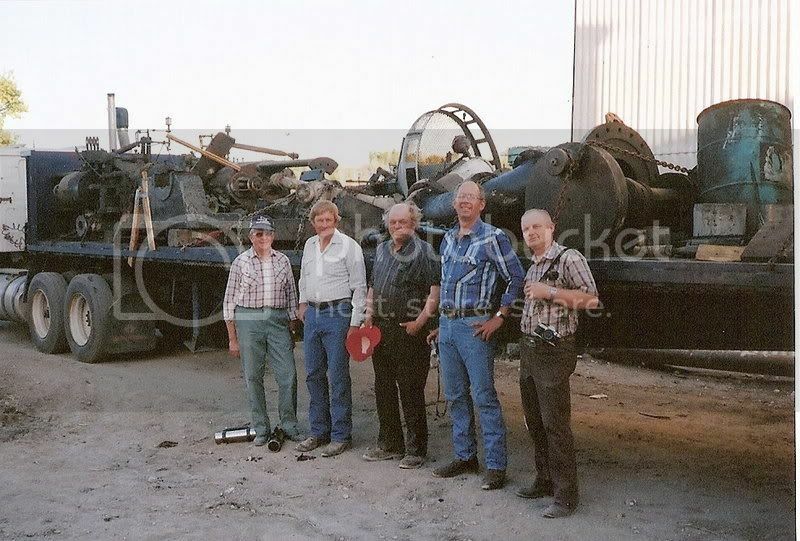 The proprietors of that show, the South Central North Dakota Thresher's Association located at Braddock, ND (approx. 50 miles southeast of Bismarck) have intend to erect the engine on their show grounds in the next several years. They’re looking for a Project Manager and any help that might be available. If anyone is interested in working on the engine and project at it’s new home, I’ll be glad to hook you up with that team. Jeff, would you be willing to share the photos on disk or thumb drive for that group to mull over as they lay out their execution plan? PM me if you’re willing to do that. thanks and have a great day. They may want to come back and pick up the governor. Someone in the gas engine area was running it with a gas engine at what i feel was an unsafe speed for the base it is mounted to. Im sure the base is substantial enough for moving around and static display but it was really bouncing and wobbling all cribbed up trying to steady it. Would hate to see it tipped over and broken after all these years. I don't understand the 3rd party hosting thing that is showing up on photo bucket accounts now. I have heard the same thing from others. The good news is there is no longer a need to host with a 3rd party! It is easy to post pictures here now, and they are hosted by this site. You do have to resize them as most modern cell cameras (et,al) take HUGE pictures and this site does not resize them. If you have any questions... PM me. Now back to the Nebraska Engine...! Mark, does that mean I can get to the pictures? If so, how? Little trouble with technology on this end............sorry. Not that I am aware of. Jeff would have to do something with his account and I am not sure what! I am sure he still has the pictures or could get them from Photobucket. Problem is that technology keeps changing! Jeff does check in here from time to time and he will see this and get them to you. When I had the disc of photos, I printed off and collated all the photos, making up 3 (light blue in color) binders. Last I knew, Tim M., Jeff N., and I gave mine I had at the time, I think, to Jeff L.
I have not looked yet, but I think I still have all the photos on my hard drive. I'll look and let you guys know what I find. Found this about 3rd Party hosting. Photobucket wants money to use thd embedded url link and from what I've read, it's $400 a year subscription. Not sure Alan, but in the long run concrete is not the place to cut any corners. Do you have any drawings or anyone working with you folks who have tackled anything like this before? No need for remote hosting any more. You can host them right here. Just click "Upload a File" next to the "Post Reply" button. I don't want to cut corners but I need a place to start. Our club has not done anything on this scale. 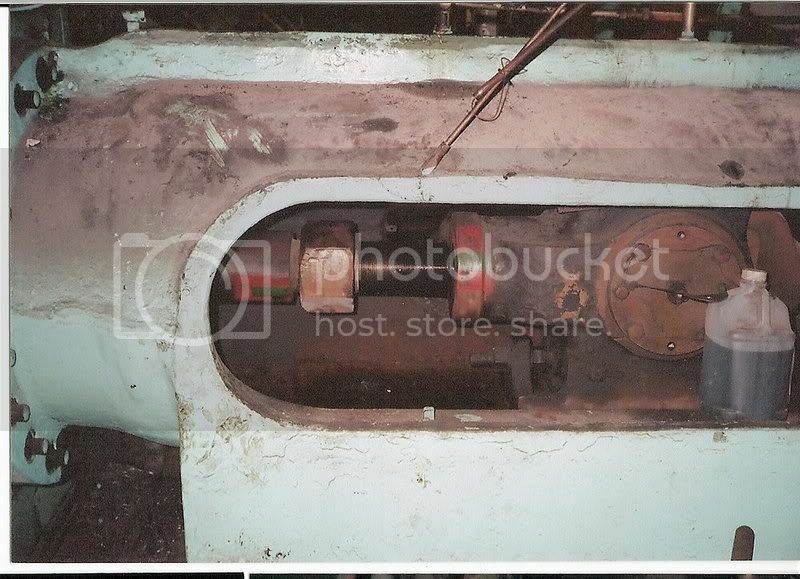 I'll PM you with the name and contact information of the last person who took any interest in that engine at WMSTR. It might take me a couple of days to get it done.